To The Remnant: History, Hearsay and Heresy Part 5: Ain't that Brother Brigham? So, the question I encounter is this: How can one have any faith whatsoever in the leaders of an organization that has been shown over and over and over again to have lied, from the time of Brigham Young all the way down to the present baldfaced lie that general authorities have not been behind the current spate of excommunications of people who were raising embarrassing questions and pointing out glaring inconsistancies in current church doctrine? Every Latter-day Saint knows that our God is a God of truth. Believing in and following these leaders is a classic case of gross UNBELIEF which our Lord has declared to be one of the great failings of our generation. The lies and deceits coming out of this organization wh. touts itself to have the fulness of truth are disgusting beyond my ability to communicate. Apostasy? OH YEAH…Indeed the ancient prophets saw our day and warned us of this. Time to follow Christ and let no man convince you there is safety in following any mortal man. A growing number of us are starting to realize that the leaders of our various organizations had good point and bad points and were used by God for His purposes to preserve pockets of Saints until the pure in heart can be gathered. We are realizing the walls of separation between us are of our own doing and not God's will. We are seeing that it is time to breakdown those walls. We are recognizing authority to administer the ordinances in all the churches of the Restoration and beginning to accept where we once rejected. The LORD'S whispering voice is calling to the pure in heart, as it whispered to the Nephites and at first they did not understand. But more and more will begin to listen for the voice and we will begin to gather together to worship and fellowship in spite of the separation leaders and "stalwarts" will want to maintain. I eagerly await those days ahead. "A prophet is called and chosen by God and is a righteous man with great faith. The Lord reveals truth to him through the Holy Ghost. He commands His prophet to teach truth to all people. Those who believe God’s words as revealed through His prophet are blessed. We have frequent opportunities to sustain Church leaders publicly. Sustain means to support. We are to prepare ourselves so that when the prophets and apostles speak, the Holy Ghost can confirm the truths they teach, and we can then determine to follow the counsel they give us. Those who listen to and follow the counsel of living prophets and apostles will not go astray. The teachings of living prophets provide an anchor of eternal truth in a world of shifting values and help us avoid misery and sorrow. The confusion and strife of the world will not overwhelm us, and we can enjoy the assurance of being in harmony with God’s will." Have you read the below listed article and the paper it references? They are quite convincing. I have read both the article and the paper. I find the paper unconvincing for a number of reasons. Clearly, there were lots and lots of testimonies recorded years after the fact. I don't deny that at all. And as the paper acknowledges, some are second hand, some are clearly fraudulent, and many disagree upon important facts. Nevertheless, there was clearly a groundswell of people who believed something or other miraculous happened. But as the paper makes clear, there were no concurrent accounts recorded at all. The journal entries and newspaper articles from the period make no mention whatsoever of anything out of the ordinary. All the miraculous reporting was added years later. I watched as President Monson announced the change in mission age in October 2012. It was a policy change. He never said it was a revelation. He never said the Lord is hastening the work. And yet, I have heard dozens, if not hundreds of testimonies claiming president Monson had a revelation and the Lord is hastening the work. And we have the ACTUAL VIDEO of the event we can watch anytime we're not too lazy to bother. So, given the fact that we'll gladly invent the miraculous after the fact, even in direct contradiction of easily-accessed proof otherwise, and we'll do it based on herd mythology, I don't find it hard to believe that people would do the same in the 1800's, when there were NO verbatim records to check, but there was an extraordinarily strong, and tight-knit herd mythology. Human memory is fraught with unreliability. It's very easy to "remember" details about an event that were not there, simply because someone else explains them to you. I still laugh about an event that happened while my brother was on his mission. He was halfway across the world at the time, yet he's heard the story so many times, he swears he was there. He can tell you all sorts of details about it. It's really funny. There were several hundred (or several thousand, depending on who you believe) people there, and they could easily "remember" details years later after hearing versions of them through the Mormon Faith Promoting Rumor Grapevine. They had it then just as we have it now. But the actual records of the day, written when memory was fresh and powerful, deny the event happened. Everyone agrees on that. I actually noticed an account of the event in an ancestors dairy that was not a high profile member of the church. This got me thinking that perhaps some of the saints did have the experience causing leaders of the church in later years to play off of their experiences and retroactively provide sensational testimonies of their own to justify the succession choice of BY. To me the larger issue has to do with whether God uses such a transfiguration antics as the approved method of succession and divine appointment. If one documents everything God tells us in modern revelation about the process of succession, particularly with regard to section 43, it becomes apparent that making someone look and sound like someone else is not the approved and appointed method. Hence, if such an event did take place, it would more likely be conducted by the adversary than the Lord. 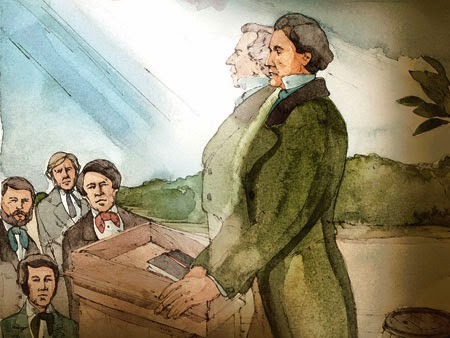 What the saints should have been looking for, according to the succession protocol in section 43, was not a circus act of transformation, but rather, someone who had been appointed and ordained by God through Joseph Smith. The saints were expressly commanded to not accept the "teachings" of any man as "revelations and commandments" that had not been thusly appointed. Had the saints been obedience to that commandment, they would never have allowed themselves to be re-baptized in Utah under the commandment of Brigham Young, and they would not have been duped into accepting the many false doctrines that he taught. I agree they had the right to reject the Lord's designated successor by using the law of common consent to actuate their own choice. Yes I agree that is a fair reading of Section 43. Hyrum was of course ordained by Joseph as his successor . He was the only one i am aware of . Do you know of any other, If the answer is no is it your position that their is no higher authority in the church since Josephs death ? In your view what does this mean for the COJCOLDS ? Since there is no list of keys held by the church, or keys held by particular quorums or officers, there is no definitive way to say which keys are held by the twelve vs. the first presidency, etc. I think it's valid to read these verses in section 112 in the larger context of the section, which is about missionary work and sending the twelve "among all nations" and "into all the world." The twelve specifically hold the keys to this missionary work and to "unlock the door of the kingdom" in places where the First Presidency cannot come. That makes the keys of the twelve subordinate and inferior to the keys of the first presidency. D&C 107 makes it clear that the function of the twelve is missionary work. The Benjamin F Johnson quote is directly from his autobiography published in 1847 titled " My Life's Review". That seems to be a timely account. I found the transcript online. How closely did you check out these references? I believe you mean 1947, not 1847 (easy mistake to make ;-) The transcript in question includes a letter he wrote in 1903. You have the problem that spiritual experiences don't lend themselves to the same kind of analysis that natural phenomenons do. I'm sure we would all be untroubled by one person commenting on a profoundly spiritual sacrament meeting, (maybe it was a spiritual experience that changed an individual's life so that they would not forget it), and then hearing from another person who was present that it was just a regular meeting of no consequence. That isn't troubling because we are comfortable with the idea that one person can be affected by the spirit and another not be affected by it, even if they are in close proximity and listening to the same speaker. We aren't trying to establish whether or not an earthquake took place or an explosion or some other such event. We are determining whether or not a spiritual witness happened. The fact is that individuals who were present insisted that they did have such an experience. Their witness is unaffected by those who adopted it for themselves or who embellished it. It is also not necessarily to be rejected simply by the late reporting. Joseph Smith didn't record the first vision until long after it happened and the details he shared were not the same in every retelling of it. I would argue of course that the details were not contradictory even though they were not always the same. From a historical perspective Brigham Young's transfiguration has better support than the first vision does (multiple accounts, from people that we can verify were present for the event) while I understand the doubt that many have over both events I don't think historians have the ability assert conclusively one way or the other on either event. Which leaves us with a question of faith, I am of the firm belief that both events did in fact take place. You're missing the point that the people who testified of such a glorious spiritual transfiguration are the same people who recorded nothing of the sort immediately after the meeting. They are the same people who spoke nothing of the transfiguration for decades after the fact. If is was so glorious and meaningful to them, there is literally no conceivable way they would have omitted it from their records. You're comparison to saints with differing levels of spirituality is not relevant in this case. The Brigham Young transfiguration event is the 'keystone' of the Church's "unbroken chain of authority". Such an important principal should not be so heavily reliant on s historically illegitimate event. This one really hits home for me for a couple of reasons. I don't know if you, or anyone else, has ever listened to Truman Madsen's "Presidents of the Church" lectures (interestingly not titled "Prophets of the Church")given some years back. I own the CD set and I've listened to them many, many times. I loved them. Of course, having the veil on unbelief stripped away and allowing the Lord to start anew with me, I can't listen to them in the same way anymore because there's a lot of unintentional untruth mixed in with the good stuff. But that's a conversation for another day. At any rate, Brother Truman relates this story of Brigham "taking the mantle" and appearance of Joseph and he's very emotional about it. He chokes up. He weeps. He believes it and accepts it as Divine manifestation. I don't think anyone could argue Brother Truman's sincerity or devotion to the Lord. I think by just about any measure he's a good, righteous, humble and decent man. I think most of us would probably consider Truman one of the giants among us - up there with Brother Hugh. I hold him (and Hugh) in the highest regard. And yet, if he, one of the giants of our faith, can be deceived by this account, what does that say for the rest of us? This example, to me, shows just how powerful emotion is and that emotion is not Truth. We're all susceptible to it and the Adversary will use it to manipulate, control and blind us. Deception is the Adversary's oldest and most effective trick and a lot of us (referring mostly to myself) will spend a lifetime trying to separate the truth from the deception. It's not easy. My son was teaching an Elder's Quorum on Sunday, and he started it by telling an emotional story about his pet dog and how it was injured. He told how he gave it a blessing and it was healed miraculously. After this story was told he asked the men if they had received the Spirit telling them it was true. They all said yes. He then told them it was a fabrication and what they felt wasn't the Spirit but emotion. They were not happy with being tricked. Some took the lesson and spiritually became more discerning. Others were embarrassed and never came back to church.. I see your point, and I would agree with you if human memory were really that reliable. But study after study shows that human memory is not reliable at all. For example, I recently read a study in which young adults were convinced they had committed a crime in their teenage years that they had not committed. If it only takes three hours to convince someone of something very negative, and have them produce detailed false memories of the event, how easy would it be to convince someone who was there that they saw something positive they didn't? Particularly when such memories are welcomed and encouraged? They weren't lying--at least not intentionally. They all honestly, sincerely believed they were telling the truth years later when all the "impressive" details got shared and amplified among the insular Utah Mormons. Now, as to your thought that perhaps some witnessed and some didn't, I'll reiterate the point that NOBODY made any record until years after the fact. I have read the first hand accounts just like you. Yes they are impressive. But they were ALL recorded many years after the fact, and they were fiction. There is still not one, single, recorded account from the time period. People were certainly not shy about recording and sharing it. So why did they wait so many years? And why did the results of the meeting contradict the alleged event? It just doesn't hold up to any kind of scrutiny. This isn't a case of some seeing it and others not. This is a case of absolutely nobody talking about the glorious transfiguration for years after the event. Then later - much, much later - those same people who never spoke a word about the transfiguration, suddenly begin to testify and record their memories. That is not a legitimate method of recording history. Here's another myth that has just gotten started in the last few weeks. I just heard this story from someone in my ward whose parents were in attendance at a Church meeting in Canada (they share Wendy Watson Nelson's hometown) with President and Sister Nelson. The gist is that the wife of President Nelson (Wendy Watson Nelson) intentionally led the audience to believe that the Lord visited their home and met with President Nelson in his bedroom in the middle of the night. President Nelson never corrected her, but went right along with it. "Sister Nelson Speaks of Moments-too-Sacred-to-Share That Testify President Nelson Is Our Prophet"
...this is what appears: a pop-up window which says, We're sorry! The page has been removed. Wonder what happened to that story? Did LDSLiving.com get a phone call from the Church? Why would they take that story down? So would you like to hear what the story (read, "myth") was? The adult child whom I heard it from told it as follows, paraphrased below. And I must add that the way the story was portrayed was calculated to give the very impression that Sister Nelson desired to give the audience; that impression being that the Lord personally visited her bedroom that night and revealed something to President Nelson. Next to our bed is a night stand with a pen and notepad on it. Almost every night President Nelson will wake up in the middle of the night and write something down. It may be just a few words or a lot. But I emphasize that he's writing down things virtually every night. One night, I got this impression I should leave the room and give him some privacy. I ignored the prompting, justifying that I was sleepy and didn't want to go sleep in another room. But the prompting came again, so I dragged myself out of bed and left the room for the night. The next morning President Nelson came to breakfast and had such a bright countenance. He was beaming. He said he had received an answer from the Lord and I could tell he was energized and full of light, like I've never seen him before. I was grateful that I followed the Spirit and gave President Nelson the privacy he needed to have with the Lord. The person who shared this account said he heard it from a close family member who was there, and heard this account first hand. LDS Living obviously knew this would be a popular article to read, so didn't hesitate to publicize it. But removed it as soon as they were asked to take it down. This story by Sister Wendy Watson is yet more folklore promoted by the leadership to get members to run wild with their assumptions. I sense that it's a masterful display of deliberate mind control techniques. The false idea has already been planted: that the president is a true prophet, seer, and revelator, and that he meets with the Lord. All that needs to be done is to feed that lie ever so slightly. They know that even a slight insinuation is wildly interpreted by members to mean exactly what they want members to think: that the Lord appeared to President Nelson.